Event: Twissup, Burton upon Trent. Aim: Drink beer, have fun, don't get arrested. 1) Some beer is brewed with rice and maize for smaller bubbles. This makes it perfect for consumption with Indian cuisine. 2) "Carling holds 40% of the lager market for a reason. The numbers speak for themselves". 3) Eight year old Queens Ale doesn't taste as good as you might hope. 4) P2 stout with Strawberries and clotted cream is heavenly. 5) Wetherspoon's full English saves lives. 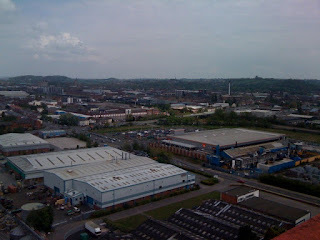 6) Burton on Trent is a curious mix of period architecture and industrial estate. Fully expect to be charmed by small reminders of the town's brewing heritage on every other street corner. Fully expect to have the convenience of a Matalan and a B&Q whenever you might need it. 7) The National Brewery Centre can boast a national treasure. His name is Steve Wellington. 8) Indian restaurants WILL stay open if you attack in numbers. 9) Never fall asleep at a dinner table when BeerReviewsAndy is close by. 10) Carling C2 is still Carling C2 if you drink it out of a brandy snifter. 11) Blue Moon just isn't a very good beer. 12) The hospitality extended to us by Molson Coors was fantastic. Thank you very much! 13) If you put 20 plus beer lovers together, for the day, in beer town, with one beer related activity to do after another, you're on to a good thing. Thanks very much to all those that were involved in setting up and sorting out the day. I missed Sheffield but had a great time in Burton. Looking forward to the next one. If you're now thinking "what the hell is a twissup" (and you've managed to read this far), this bit's for you: Twissup is an event for beer enthusiasts from any walk of life, a chance to get together with like minded people, drink good beer and explore a town. Anyone can come and everyone is welcome. The first one was back in January and took place in Sheffield. The second, as you'll realise by now, took place in Burton last weekend. Keep your eyes here and here for the next one. Brilliant post, you got it absolutely spot on mate!! I was going to write about Twissup but it'll be easier and better to just link to this! Thanks mate, much appreciated. Think it's missing a group photo, hopefully one will show up.